In the spring and early summer, my family is busy. Besides all of our regular activities at home and on our urban homestead, it also happens to be baseball season. Big brother and little brother love baseball and it’s no joke that in May and June we spend the majority of our evenings during the week at the ball fields. After their practices or games, it’s usually nearing 7pm. I would like to pretend that I’m super organized and have a crockpot dinner waiting at home, but that’s not always the case. Sometimes we stop for a ready made pizza or Chipotle (keeping it real here). Sometimes, I crash my mami’s home and, God Bless her heart, she feeds us; however, I’m also armed with quick and simple supper ideas that come together quickly that my entire family enjoys. Namely, grilled cheese sandwiches or blt’s that I serve with cold gazpacho soup. Who doesn’t love a good grilled cheese or blt and, let me tell you, it pairs beautifully with cold gazpacho. The entire meal takes me about 15 minutes to make. Super simple, super quick to make, and super good for you. For this particular meal, I was approached by Latina Bloggers Connect to come up with a recipe using Real California Cheese. I enjoy being a bloguera for this community that empowers Latina bloggers, like myself; however, I was a bit hesitant at first. I had to research Real California Milk and when I discovered that the seal is on the brand of cheese called, Cacique, I knew I could take part. Although not local, I do buy and use Cacique brand of Mexican cheeses. Particularly when I’m cooking with some of my friends from Mexico. We’ll usually buy Queso Fresco or the Oaxaca (which my boys always laugh at when I pronounce it a certain way 😉 It was important to me to learn that .99% of California dairies are family owned. Although I fully endorse locally produced milk, it is nice to know that you can get most of these Mexican cheeses throughout the United States for those special occasions. For this simple grilled cheese sandwich with spinach and Spanish chorizo sausage, I decided to use the Mexican Manchego from Cacique and toss around the flavors that make up both of my cultures. Making a grilled cheese sandwich or montadito, as they call it in Spain, is ridiculously easy. For this sandwich, I toasted my bread then layered on spinach for health and Spanish chorizo sausage for good measure. I shredded, then sprinkled on a good amount of Mexican Manchego cheese which is soft and creamy – much different than a dry, Spanish Manchego. Once layered with cheese, I placed my baking pan with open faced sandwiches under the broiler for 2 minutes. I then topped it with the final piece of toasted bread and called it supper. I don’t think it can get easier or better tasting than that! During those busy spring and summer days, a grilled cheese sandwich is a fantastic option for a fast and nourishing meal. Toast two pieces of bread per person. Place one piece of toast per person on a baking sheet. 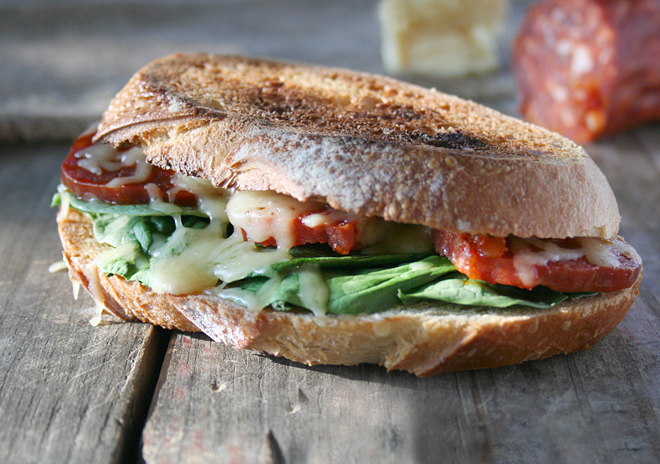 Layer the piece of toast with spinach, slices of Spanish chorizo sausage, and Mexican manchego cheese. Broil on the top rack of your oven for 2 minutes. Top each open faced sandwich with the second piece of toasted bread. 2 preguntas: 1) I love your white plate! What maker and design is it? 2) We have an abundance of Mexican chorizo around here but I have yet to find Spanish choritho. Do you have any ideas as to where I might find that? I remember loving it while I was in Spain, but am not so fond of the Mexican version. Also my hubby, who is Mexican, wants to know the difference between the 2 versions. Thanks! Looks delicioso!